The spellslinger upstairs conjures too loud and the guy down the hall drinks blood from a six-pack. That stiff you left in the alley is walking again and the undead factory workers are on strike. Your client skipped town before paying and your landlord is looking for his rent. 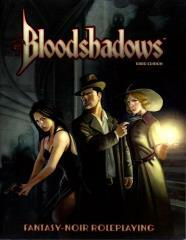 Bloodshadows combines pulp adventure with dark fantasy and noir stylings. Tough detectives in weathered trenchcoats swap biting comments with vampires in evening gowns. Humans walk the dark streets of the city alongside demonic breeds and long-dead ghouls. Magic is everywhere, even if just to light a cigarette. Death waits around every corner--undeath sometimes follows. The Wilderness holds even more danger, kept at bay only by city gates and those who patrol them. It's a dark, brooding world filled with shadows and wonders. You are the monster. Portray Vampires, Werewolves, Succubi, and others -- or even Humans. Are you a crook looking for your next score? Or the sentinel sent to stop him? Maybe you are a private detective looking for your client's long-dead husband who just returned. 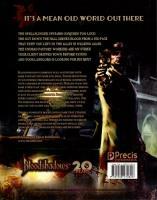 You could be a spellslinger hired to help rob one of the big rich on the expensive side of town. Perhaps you just infiltrated the out-of-your-league party to get the story that no one else can. And do you dare to choose a side in the brewing Godwar or just go about your own business? Investigate mysteries. Look for clues. Use your contacts to get information or locate items of interest. Cast magical spells or draw your runeslug-loaded pistol to gain the upper hand. Chase your enemies in the streets on foot or by car. And only enter the Wilderness at your own peril. Part Horror. Part Fantasy. Part Noir. Part Pulp. This stand-alone game is powered by Precis Intermedia’s critically-acclaimed genreDiversion third edition rules, requiring only two 6-sided dice and can be played with or without miniatures.